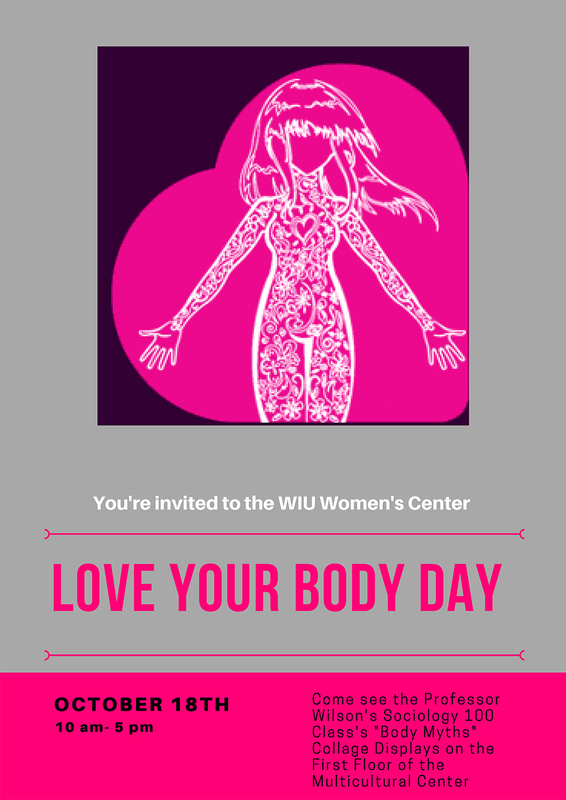 MACOMB, IL -- The Western Illinois University Women's Center will celebrate Love Your Body Day from 10 a.m.-5 p.m. Wednesday, Oct. 18. The event will be commemorated with a display of "Body Myth" collages, created by students in WIU Assistant Professor Beate Wilson's Sociology 100 class. The collages will be displayed throughout the first floor of WIU's Multicultural Center. Love Your Body Day is a national campaign sponsored by the National Organization for Women (NOW) Foundation. "Every day, in so many ways, the beauty industry (and the media in general) tells women and girls that being admired, envied and desired based on their looks is a primary function of true womanhood," according to NOW. "The beauty template women are expected to follow is extremely narrow, unrealistic and frequently hazardous to their health. The Love Your Body campaign challenges the message that a woman's value is best measured through her willingness and ability to embody current beauty standards." For more information about the event, call the Women's Center at (309) 298-2242.